Limi Valley Trek in Jumla offers the access into rarely visited and mystic Limi Valley is like stepping back in time. Due to the isolated location, the villages are very untouched by modern development. Century old Buddhist traditions interwoven with shamanistic influences are still an important part of daily life here. 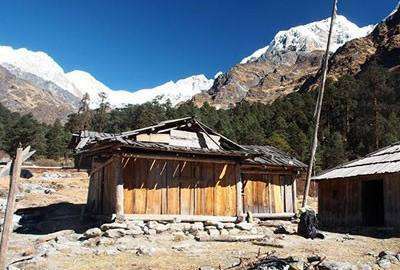 Hidden deep within the Wilderness in the Himalaya of Nepal is Humla: the most northern and isolated district of Nepal. Humla is culturally diverse, settled by highlanders know as Bhotias in northern part and occupied by Hindu Khasas in southern valley and riverbeds. You will experience this cultural diversity and rich is local tradition. Trekking through remote villages and crossing over 16000 ft high passes and discover ancient old Tibetan Buddhist monasteries in vivid Limi Valley. You follow the ancient salt trading and pilgrimage route to the border of Nepal and China, crossing the Nara La pass (4620 m) with spectacular views of the Himalayas. From the border town of Hilsa you turn northeast towards the Limi Valley.During this trek you have a chance to spot the elusive snow leopard, Himalayan blue sheep, jackals, hyenas and musk deer. You sleep in authentic, small Buddhist villages and camp in amazing spots amidst the snow-capped mountains. Due to its remote location, Humla is still an “off the beaten trek destination”. Especially in spring and summer you’ll see very few tourists. Explore and discover the ancient Buddhist monasteries and religious monuments. Day 08: Trek to Hilsa (3700m) via Nara La Pass (4620m). Day 09: Trek to Manepeme (3990m). Day 12: Trek to Tatopani (3950m),via Halji (3670m). Day 01 :Join Kathmandu (1300m) Arrival TIA (Tribhuvan International Airport) in Kathmandu, Wilderness Excursion's guide will welcome you and transfer to your selected Hotel. Welcome drink and short briefing about your trip. Overnight in Kathmandu. Day 02 :Fly to Nepalgunj (200m) Today, we will obtain your trekking Limi Valley Trekking Permits, you can do trekking preparation, sorting out gear etc or alternatively you can go visit the ancient old temples and Heritages in Kathmandu for half day. Later in late afternoon; we take a flight to Nepalgunj bordering to India. Overnight in hotel at Nepalgunj. Day 04 :Trek to Kermi (2870m) Today; we walk from Dharapuri to Kermi. Some steep stretches of trail. Ask the locals about some hot springs about a 40 min walk above Kermi. Approximately 6 hours walking today. Overnight at Kermi. Day 08 :Trek to Hilsa (3700m) via Nara La Pass (4620m). Every day the path goes up and down and walk through the pine bush. You see the old trade path of Humli people. Goes over a Nara La pass 4600m it is tough and the rock are not stik together. Always pay your attention to go a head. Overnight at Hilsa. Approximately 6-7 hours walking today. Day 09 :Trek to Manepeme (3990m). Some time you are trekking through the narrow path and see the Karnali river in the lavel. The path is windy so prepare your jacket for your hiked. Hilsa is the nearest port of Tibet and local collect fire wood and yak dong for heating take to Tibet and exchange with necessary goods. If you want to end your trek here is also possible because there is an air port. Only charter Heli flight can be operates. Over Night at tent. Walking through the grass land up hill till moraine and walk into the snow cover valley. Mostly our staffs will try to follow the local traders who are passing through Mt. Kailash, if there is too much snow. This valley is famous for snow leopard and blue ship. Approximately 6 hours walking today. Day 10 :Manepeme to Til (4000m) To day the distance looks short but on the reality convoluted path weaves its way through ravines and up and down trails. The path is very difficult and more ups and downs. You are almost walking through the trans Himalaya dread path so always careful with yak and sheep who is carrying loads for trade. Approximately 6 hours walking today. Day 11 :Rest day in Til (4000m) Today, it is design as a rest day to re-energize our body. We can do rest and relax or do some washing by Limi River. Day 12 :Trek to Tatopani (3950m),via Halji (3670m). This is you rest day to exploring the village and so on. Jang village is divided into 3 sections and very interesting to visit all of them culturally. Over night at Camp. Approximately 8 hours walking today. All international and domestic airport shuttles during the trip in Nepal. 3 nights deluxe room in 3*** hotel in Kathmandu with breakfast on double occupany. All meals: during the trip. Well experienced, government registered and friendly guide. Cook, kitchen helpers and porters to carry all the food and trekking gear. Kathmandu – Nepalgunj – Simikot flight and airport taxes. Simikot – Nepalgunj – Kathamndu flight and airport taxes. All necessary Limi Valley Trekking permits. Food, tented accommodation and salary of your trip crew. Salary, insurance and trekking gear for trip crew. Government tax,vat and office service charges. Meals in Kathmandu except breakfast. Personal travel insurance, rescue operation charge in case of emergency.